Shout Out To Our First ChefSteps Store Customer! Laurence Morris was our very first customer at the ChefSteps store page. He will be busy cooking sous vide (no doubt trying out all of our recipes) with his brand new PolyScience CHEF Series Immersion Circulator. We have some nice discounts on PolyScience equipment, and even though it’s a good sized hit to the wallet, consider that you’ve invested in an infinitely versatile water oven that will enable you to utilize cooking techniques that will deliver extraordinary results. Not to mention, we’re talking a top of the line, jaw-dropping holiday gift for that deserving food fanatic in your life. Congratulations and thank you, Laurence! 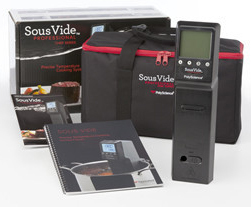 Your purchase helps keep our online sous vide cooking course free to learn. We look forward to hearing from you on the Chefsteps forum. Chris, Grant, Ryan and the rest of the ChefSteps team.